Metro Detroiters suited up for Hour Detroit's Best Dressed Celebration Presented by Hillside Furniture on November 13, 2013 at The Fillmore Detroit. On November 13, Hour Detroit magazine hosted its annual Best Dressed party at the Fillmore in Detroit, featuring our best dressed winners from the November issue. On October 17, Hour Detroit magazine hosted a party at the GM Heritage Center to honor this year's Top Docs winners in metro Detroit as voted by their peers. The list containing the winners, and accompanying medical stories focued on diabetes, the shortage of organs for transplantation, and more. On July 17, Hour Detroit magazine celebrated the area's top dentists as voted by their peers during a special party at Scavolini in Birmingham. Hour Detroit's Best of Detroit Party Presented by Cadillac celebrated the superheroes of the Motor City featured in the comic book inspired Best of Detroit issue. Guests enjoyed fabulous food, cocktails and entertainment from over 30 of the Best of Detroit winning restaurants, shops, boutiques and luxury service providers. On June 21, Hour Detroit celebrated the Best of Detroit with its annual party at Motor City Soundboard. Proceeds benefited the Go Red for Women campaign of the American Heart Association. 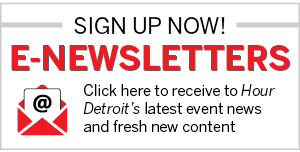 Thousands of readers selected their favorites in online voting for Hour Detroit’s 2013 Best of Detroit list. Find out who joined the league of over 500 superheroes in the city! Hour Detroit's Best Dressed Celebration 2012 was held on November 15 at the Art Van Showroom in Warren. Guests enjoyed cocktails, appetizers and an exclusive fashion show by Saks Fifth Avenue featuring Hour Detroit's 2012 Best Dressed winners. On November 15, Hour Detroit celebrated its 2012 Best Dressed List during a charitable bash at Art Van Wonderland in Warren. On October 23, Hour Detroit celebrated the area's top doctors as voted by their peers in the annual roster. The gala was held at Detroit's Gem Theatre.